We live in Columbia, near the Susquehanna River in Lancaster County Pennsylvania. 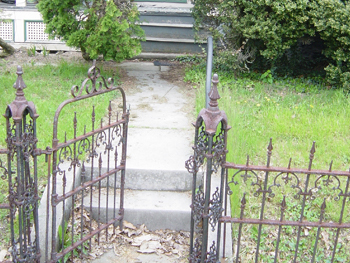 There is a lot of history to the area and many old homes throughout the county. 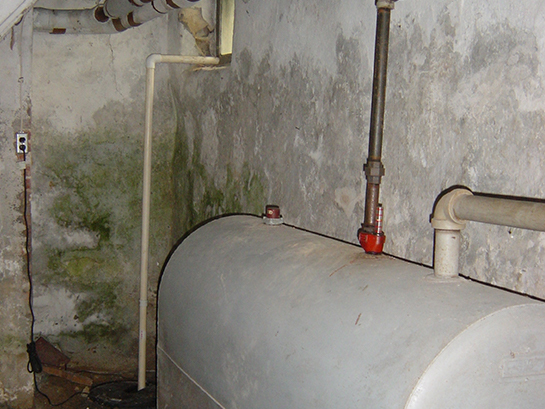 Unfortunately, many of the homes have a lot of deferred maintenance that hasn’t helped these homes age gracefully. 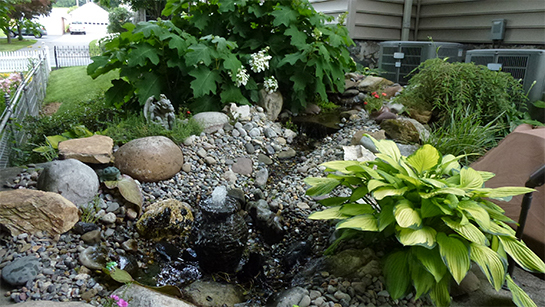 Our story begins in the spring of 2003 when I decided to enlarge our 8’ pond. I dug out for a larger pond (25’ x 15’) in the backyard of our townhouse. My existing filters needed an upgrade so a neighbor suggested I visit a nearby friend of hers that owns a pet supply business to buy some supplies. 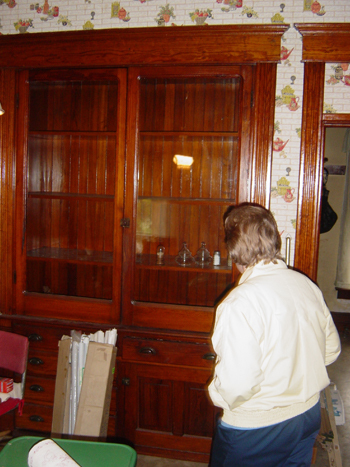 I met Charlene and complimented her on the beautiful old woodwork in their home. She thanked me and asked me if I liked old houses. I said “Yeah” but cautiously added “depending upon their condition”. She just smiled, produced a skeleton key and said “come with me”. We walked next door to a home they were watching for the neighbors. It had been unoccupied for about eight years due to the wife’s passing away and the husband having a stroke. 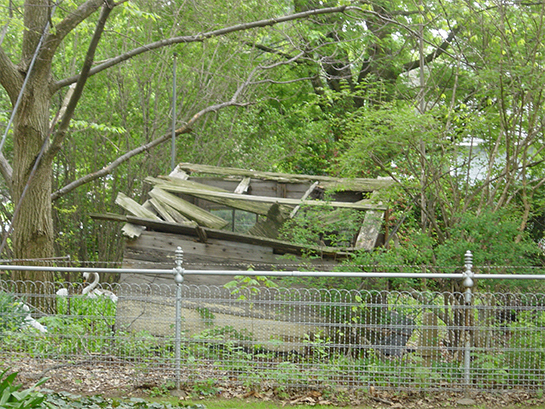 I struggled with the exterior condition when I saw it. 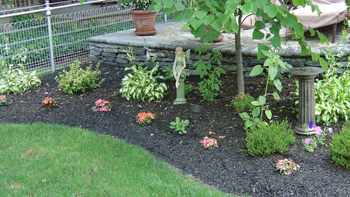 The owner was a “naturalist” and did not believe in trimming, pruning or cutting plants down. Although through the foliage I could see some character beneath the rough exterior. 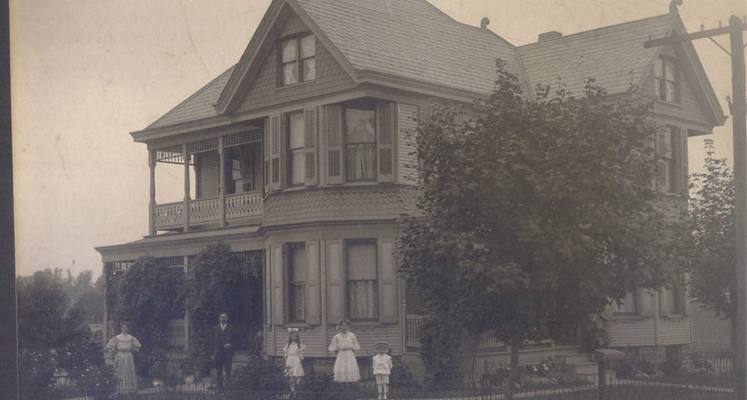 The above picture shows the house in 1910. 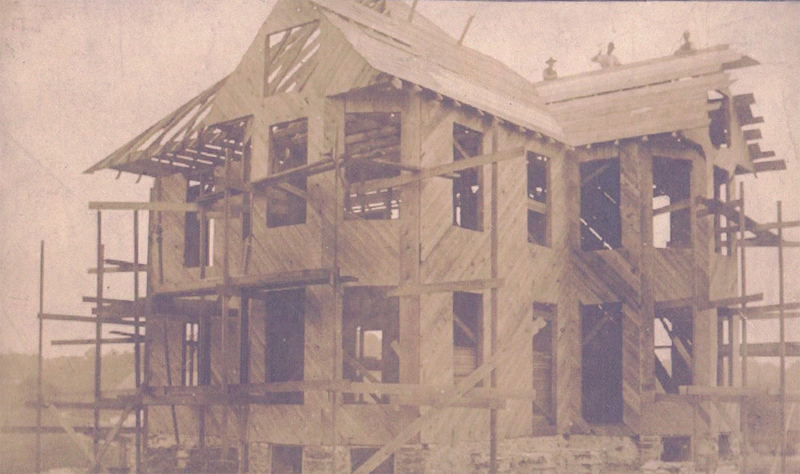 The photo below shows it under construction. When I first saw the property, the movie “The Money Pit” starring Tom Hanks and Shelly Long flashed through my head. After I showed my wife and her mother the house I made them watch the movie. This is what we first saw. 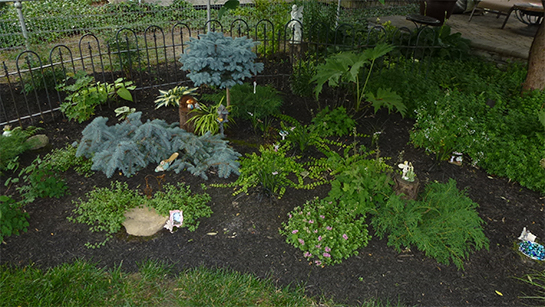 Arborvitae and ivy had been left to grow all around the house. Crepe Myrtle was abundant. 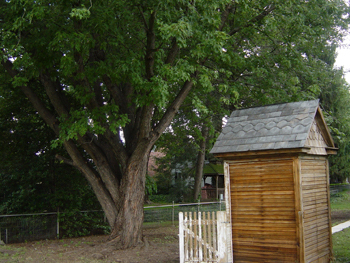 The Silver Maples, American Chestnut and Pear trees were huge but had not been manicured. 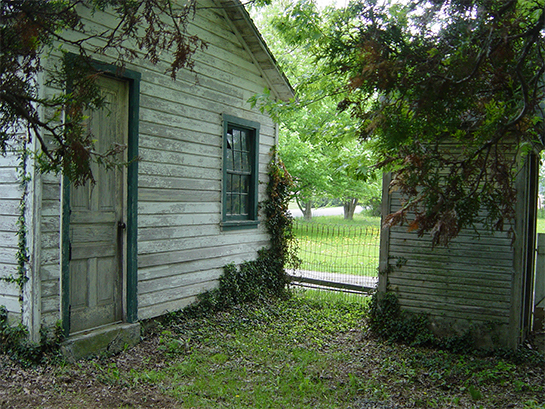 There was overgrown forsythia, raspberry briars and ivy around the garage area. 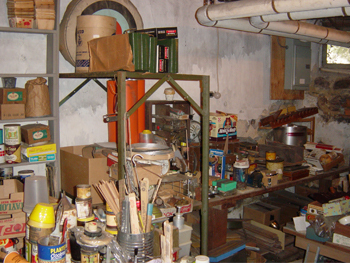 When we stepped inside I saw that the owner was a collector and a frugal person. All of the rooms had boxes stacked from the floor to ceiling. There was 1950’s wallpaper on the walls and ceilings. Full sized faded sheet vinyl flooring covered the floors. 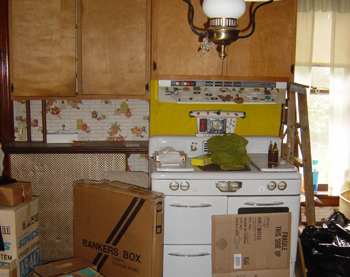 The kitchen and bathroom were very outdated. As I walked through the house for the first time I noticed that the floors didn’t creak or squeak, foundation seemed solid and the woodwork offered a lot of potential. As a “handyman” and a “glutton for a project” we began this venture. 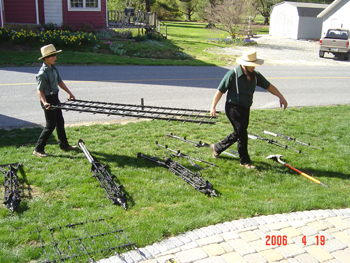 We bought the property and in August of 2003 began cleaning up the landscape and exterior. To get to the house we removed the wire and wrought iron fences, trimmed trees, cleared out brush and got rid of the chicken coop. 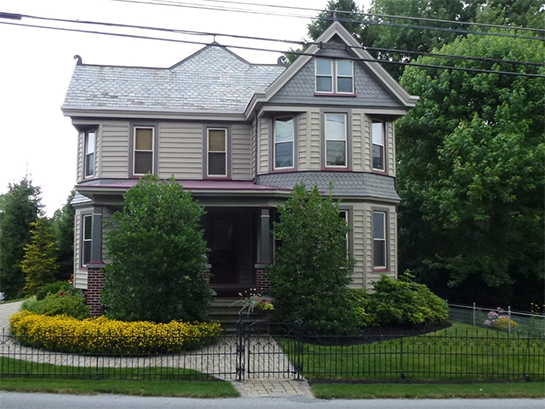 After we cleared the landscaping, we repaired the +100 year old slate roof, re-pointed and flashed the chimney; replaced missing cedar shakes and repaired trim and soffits. We pressure washed, sanded, caulked, scraped, primed and painted the exterior. What a difference time, some caulk and a lot of paint can make! Since winter was approaching we moved our work inside. 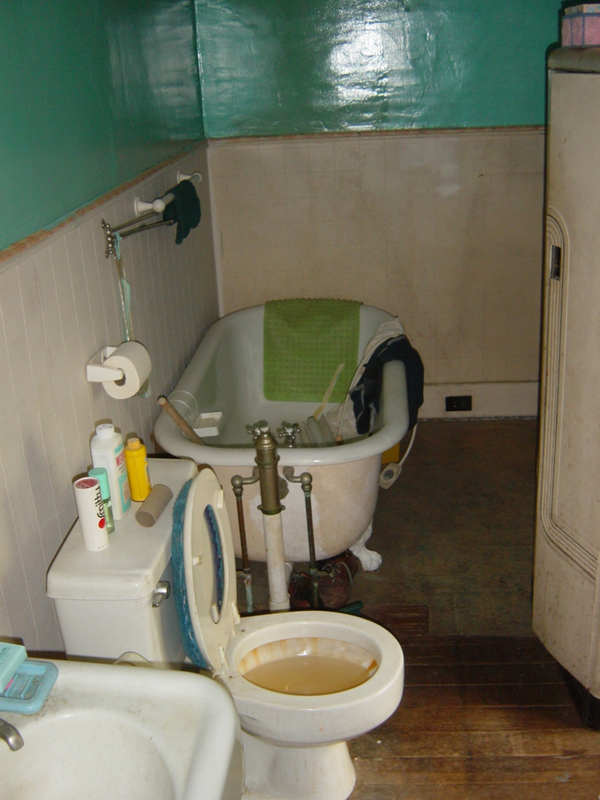 While the house was unoccupied for eight years the utilities had never been turned off. 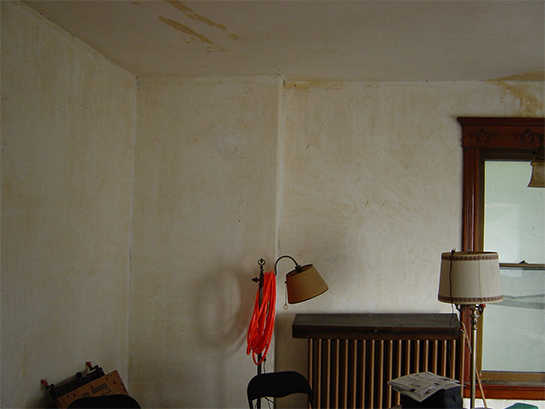 Over the years some plaster had cracked, the original knob and tube wiring was worn through at places and the wallpaper was peeling. 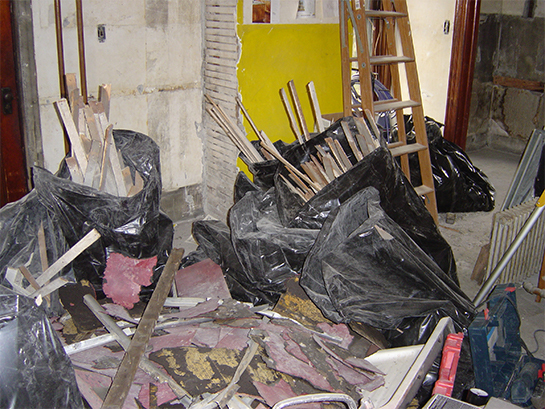 Soon after we began renovating we found the home’s strengths and weaknesses. 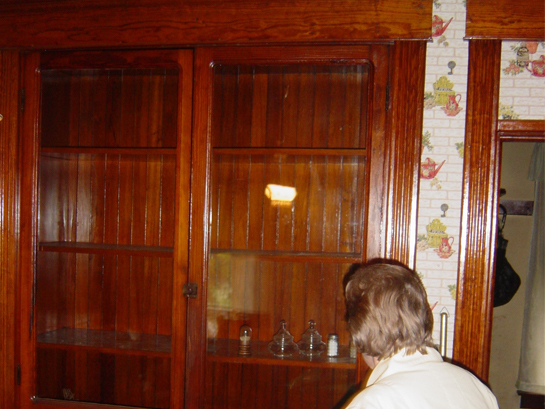 The foot wide four piece chestnut moldings, hand crafted finials, a turn-of-the-century china cabinet and a butler’s pantry door proved the original builders were craftsmen. We hoped we could do them justice. 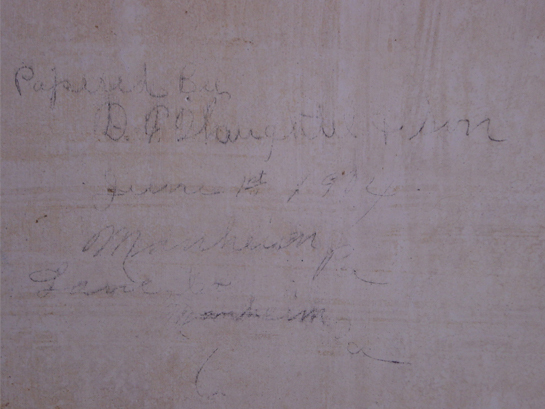 Our new neighbors stopped by often to share the neighborhoods history with us. Our neighbor’s grandfather built the house! She used to play in it when she was growing up. My wife and I had been looking for another home. 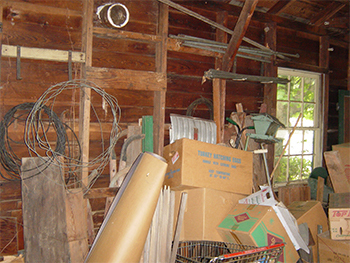 We wanted a house with more space, a larger garage and more projects to keep me busy. For the prices of new “cookie cutter” suburban home we felt we could make this one into something special. 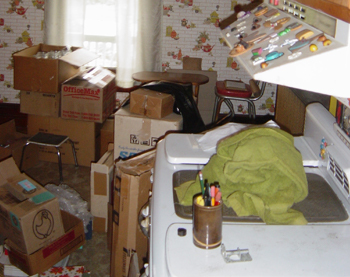 We started to realize that we couldn’t resell this house. In July of 2004 we continued the renovations to make this our next home. 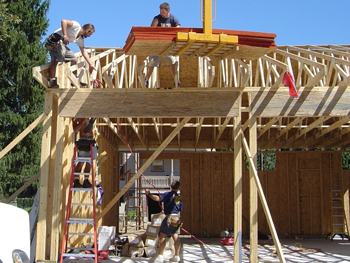 I worked on the house fulltime while my wife joined me in the evenings and weekends. 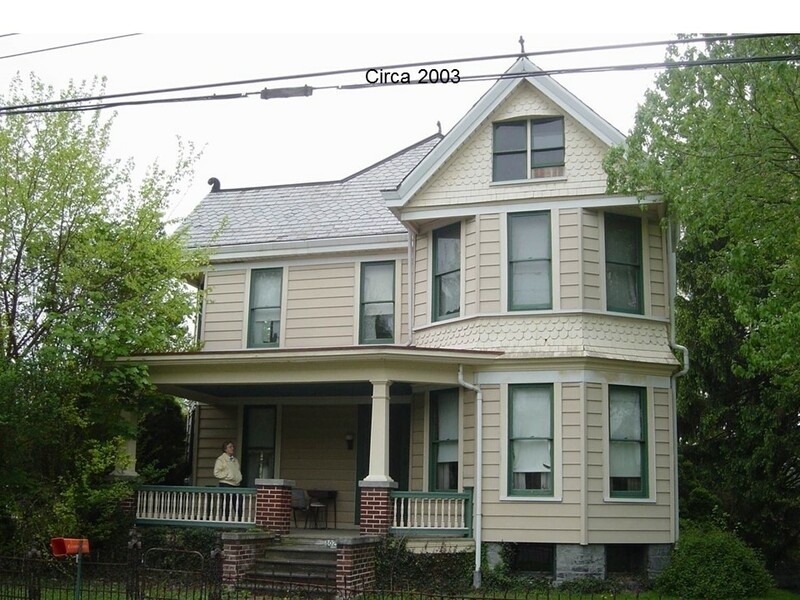 Our plans and hard work paid off and we moved into the house in late September 2004. I promised my wife that by move in we would have a home that was free of construction dust. We did just that! Inside the house we updated the electric to new 200 amp service, ran all incoming utilities underground, removed the knob and tube and rewired the house. 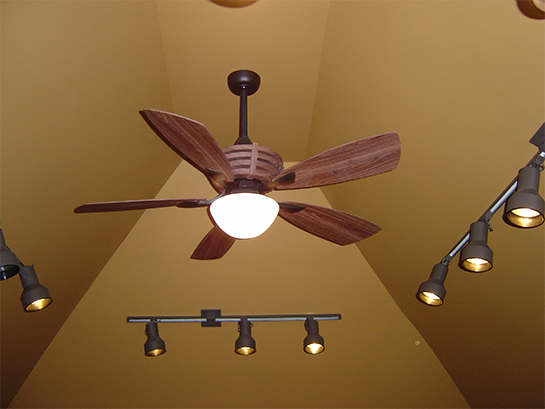 We added ceiling fans and dimmable recessed lighting in most rooms. 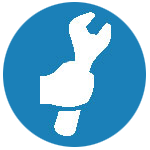 We replaced a few radiators that broke and updated plumbing for the new bathrooms, kitchen and laundry. 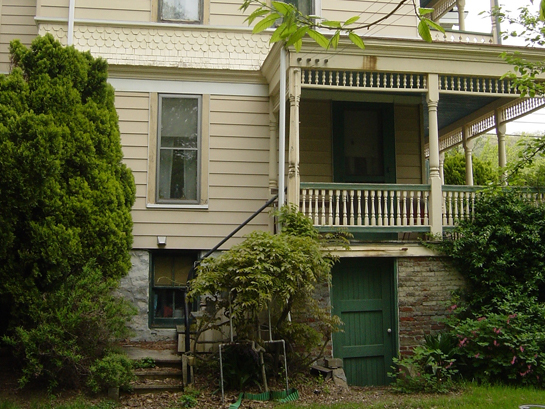 We installed a central air conditioning unit for the 2nd and 3rd floors; insulated the first floor sub floor; added a new steel entry door from the outside through the cistern area to the basement; replaced the well pump; installed surround sound, cable, phone and data service to most rooms; moved the laundry to the 2nd floor and refinished the original pine floors. We annexed part of the spare bedroom to create a 6’x8’ walk-in closet for the master bedroom. 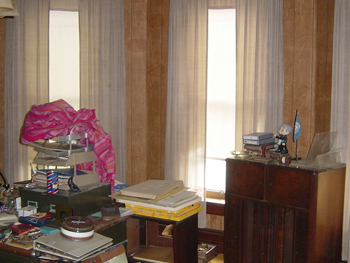 Of the thirty three original single pane wavy glass windows we first replaced the cracked, broken or badly leaking ones. 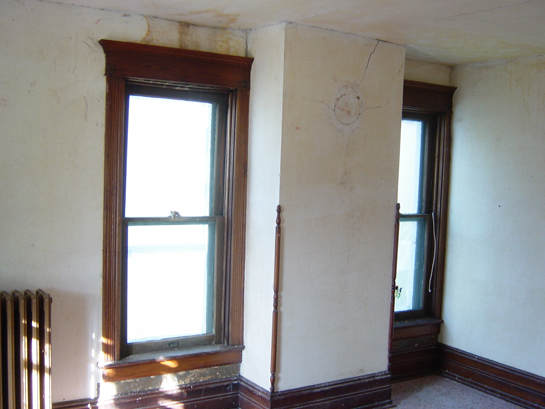 We began with all of the basement hopper windows then the attic windows and 9 of the remaining windows on the first and second floor. 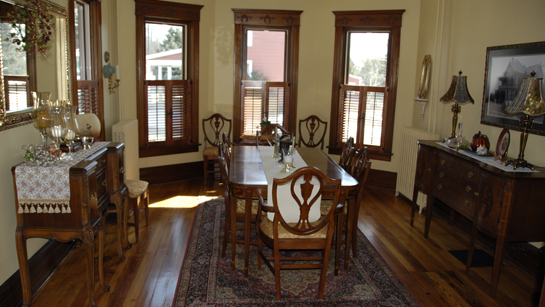 We chose vinyl clad exterior windows with wood interiors so we could stain them to match the trim. To keep the beauty of the tall windows and maximize the light while providing us with privacy I made and installed inside shutters stained to match the trim. 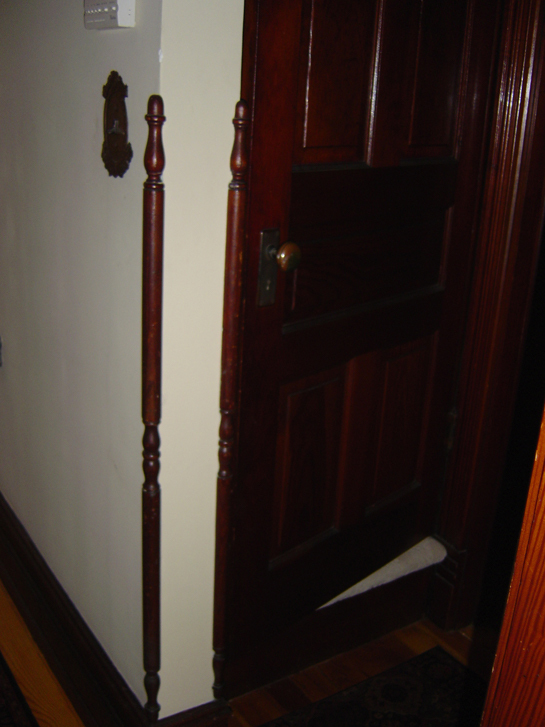 We added new storm and screen doors for light, air and protection and upgraded locks or added period style deadbolts. 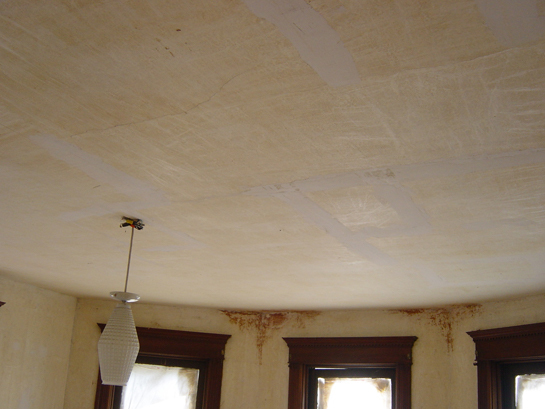 We replaced the dining room ceiling and additional zoned lighting and an in-ceiling sound system. 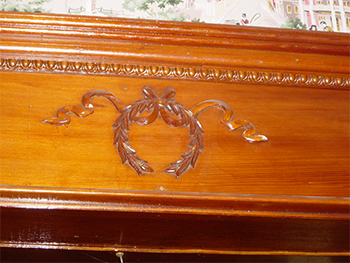 Both the dining room and entertainment room received custom butternut crown molding (butternut grain closely resembles the unavailable chestnut) profiled to match the existing door headers. 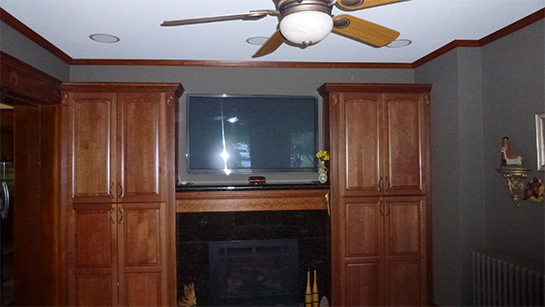 The Entertainment room also received custom cabinetry, a 60 inch plasma TV, in ceiling surround sound and a custom granite and mantle surrounding the vented 60,000 BTU three burner gas fireplace. In the kitchen we removed a door and a large radiator to fit the workflow we desired. We added a window, two smaller radiators, ceramic flooring, granite counter tops, cherry cabinets with dimmable above and below cabinet low voltage lighting, an island with a bar sink, stainless steel appliances and a wine cooler. We added a first floor powder room and pantry cabinets with above cabinet low voltage lighting, dimmable recessed lighting and a super quiet exhaust fan. 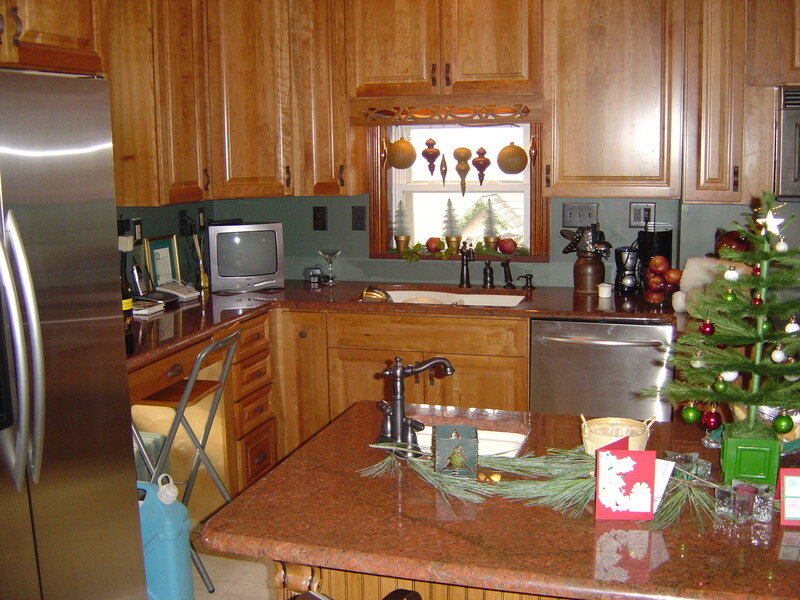 The kitchen benefited from new cabinetry, appliances, paint, lighting and our decorating touches. 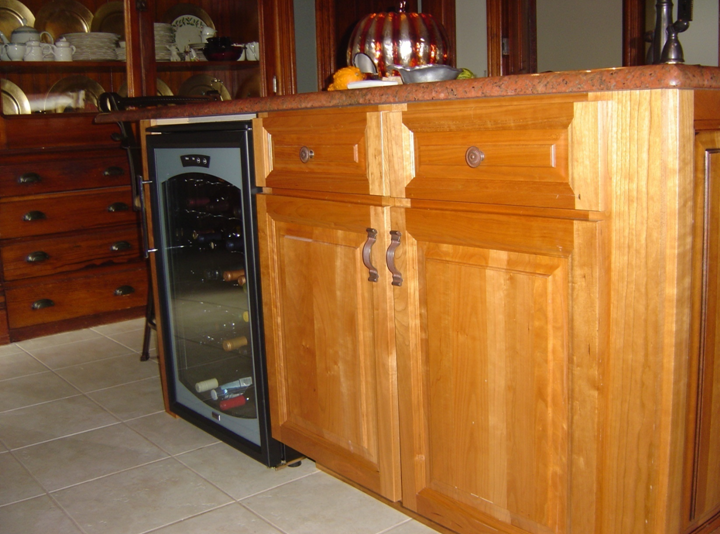 The cherry cabinetry complements the varnished chestnut woodwork that was already here. The ceramic tile and epoxy grout complements the darker wood and is easy to clean. The rich Monterey Red granite countertops and Blanco sili-granite biscuit colored composite sinks blend well with the stainless steel Kitchenaid Superba appliances. 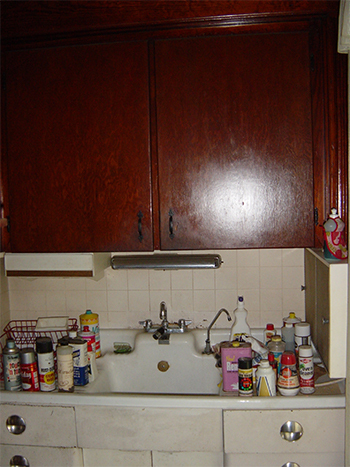 Where the original kitchen sink was we installed pantry cabinetry with pullouts and a powder room with a wall mounted faucet flowing into a round vessel sink. 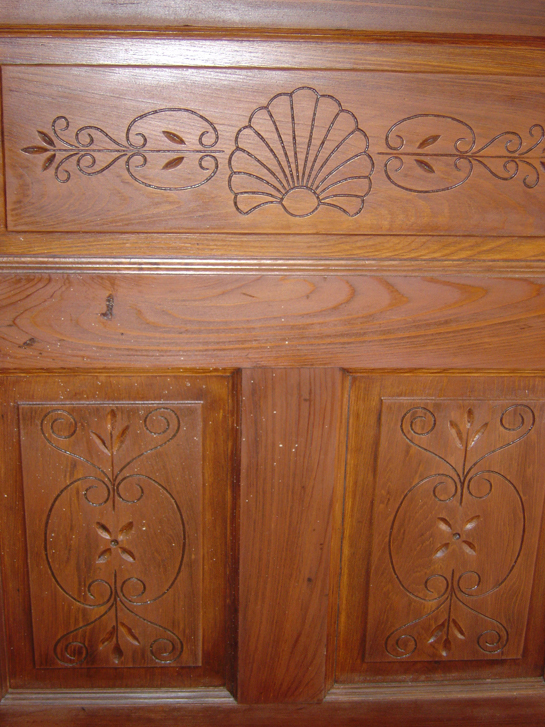 We refinished the front doors to reveal beautiful engravings. 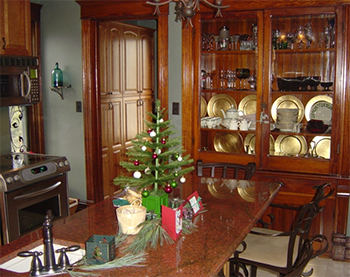 The butler’s pantry door and corner rails add charm and verify the builder’s skill. 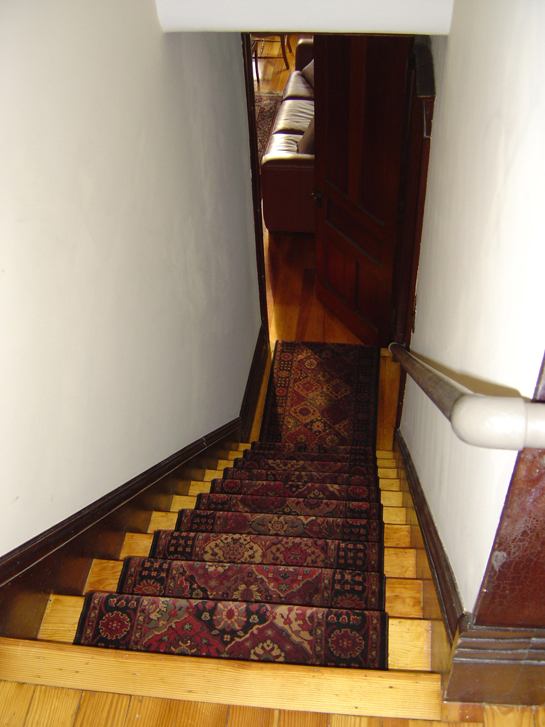 We removed the vinyl runner and put a new carpet runner on the refinished stairs to the second floor along with a new light. We gutted the original bathroom. 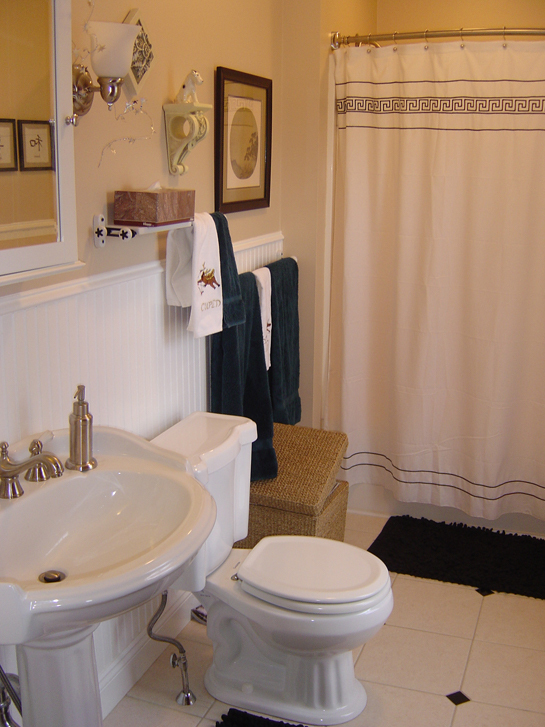 We rewired, installed a new fiberglass surround tub/shower, added drywall and laid ceramic flooring on a diagonal with corner-“gones” and wooden wainscot with “old world” fixtures to retain the Victorian charm. The bathroom went from “bad” to beautiful. The bedrooms were updated and are more livable. The Master Bedroom changed its appearance. While the third bedroom became our office and laundry. The network equipment and wireless Sonos wiring was installed in the laundry closet. 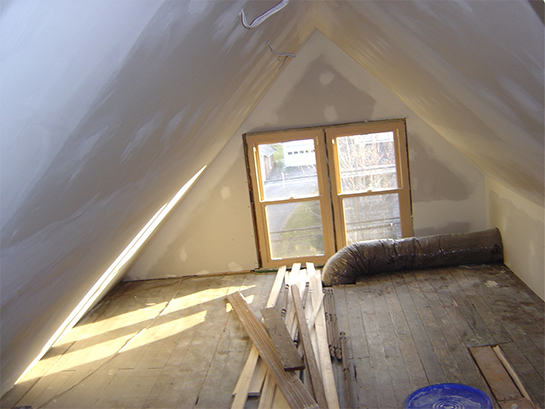 When I first saw the unfinished attic it had dead birds and areas of the slate roof that I could see daylight through. Both my mother-in-law and my father kept shaking their heads and questioned my sanity. The house is a “4 square” meaning that it has gables on all four sides. 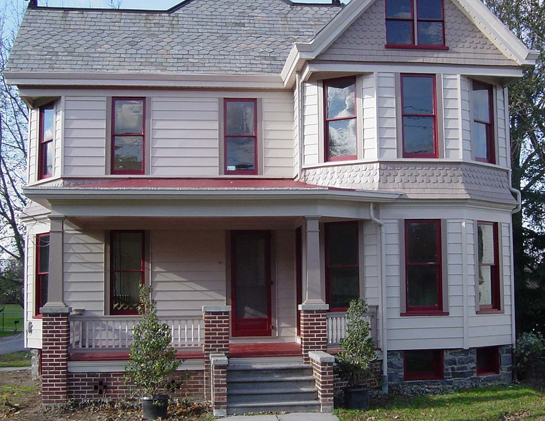 This home has the added character that each gable window sits solidly on the main compass points. The attic begged for something cool to be done with it. I spent some time upstairs cleaning out the dead birds and gathering my ideas. 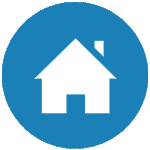 We began by running utilities for lights, fans, surround sound stereo, data and cable TV. 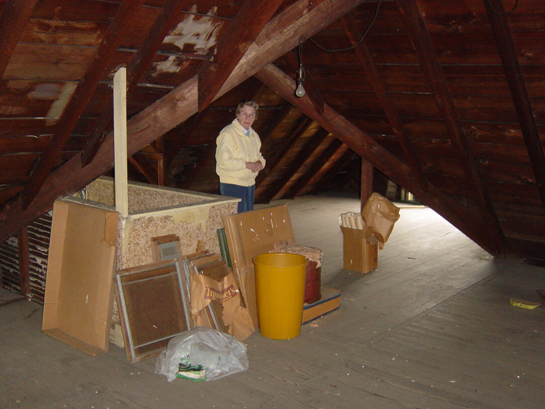 Then my wife and I spent a weekend (that she doesn’t like me to forget) insulating the 15’ peak gabled 3rd floor attic. We installed the upstairs AC air handler and ductwork then carried up and installed 48 sheets of drywall and finished the area. The roof angles and gables made this a finishing challenge. We sprayed the wall plates, AC grills and trim to match the four banks of zoned dimmable track lighting. 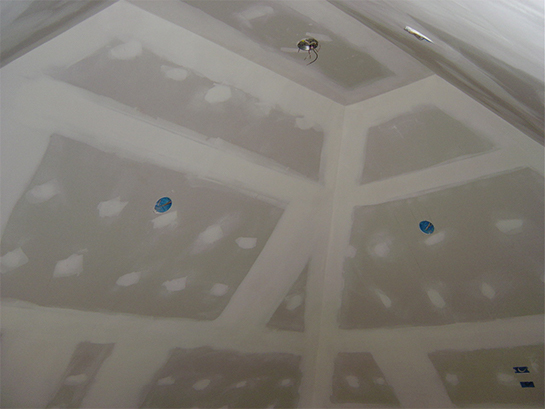 The ceiling fan and lighting inside the knee wall storage area finished the third floor walls. 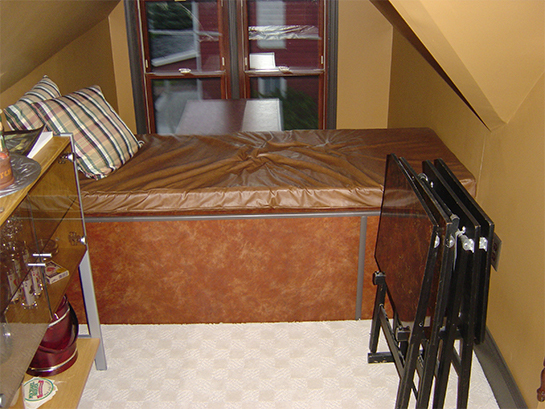 To even the floor we laid luan sheeting and installed 8lb padding before the Berber carpet. 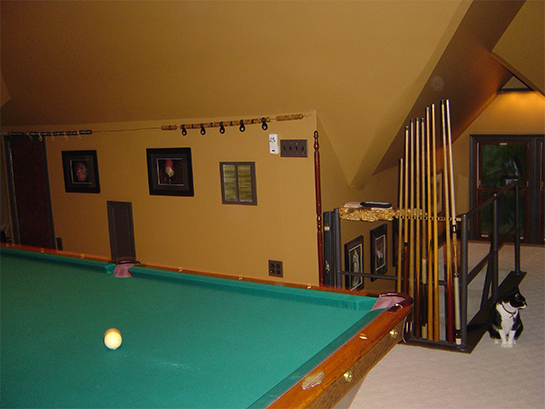 I made a custom removable steel handrail that doubles as a pool cue rack and a built-in bench to cover the AC ductwork with doors to access the HVAC air handler. 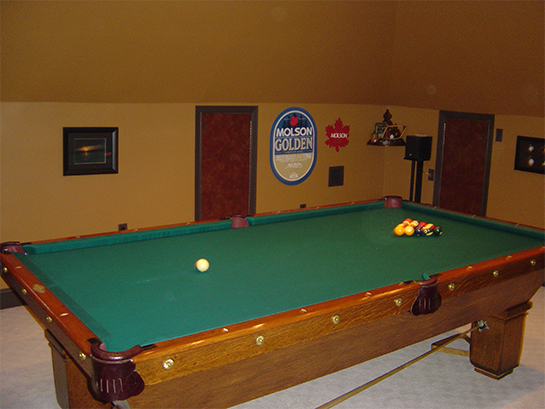 To complete the look I refinished my father’s 1911 9’x 4-1/2’ tiger oak pool table and moved it upstairs. I also made curly maple burl shelves placed around the room. 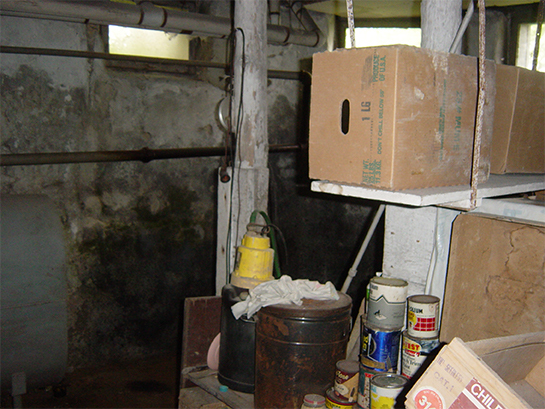 The basement needed as much help to clean it up and make it livable. 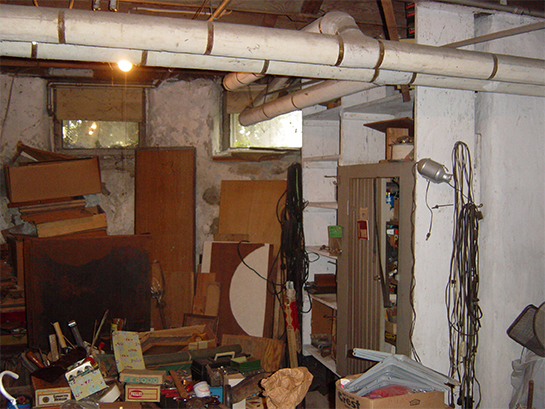 So, we removed all of the clutter, replaced the utilities and began the work. 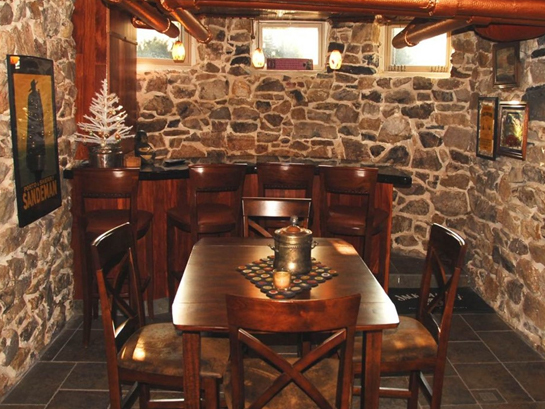 We updated the boiler to a 92% efficient model with a sidearm coil, added a 5K electric forced air heater for the bar area, installed a second air handler for the first floor and basement central air conditioning. 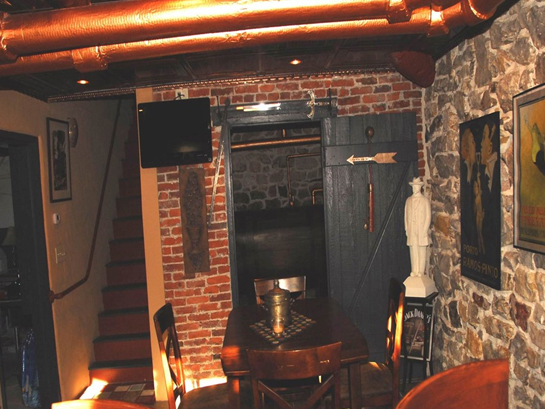 We stripped the pearlite from the walls exposing the original stone and brick foundation. We repointed the stone foundation and poured a 4000 psi concrete floor. 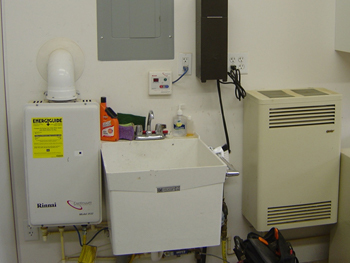 We replaced the sump system and added a battery backup system. Next I built an angled bar faced with Brazilian cherry and topped with a very heavy double thick piece of granite. 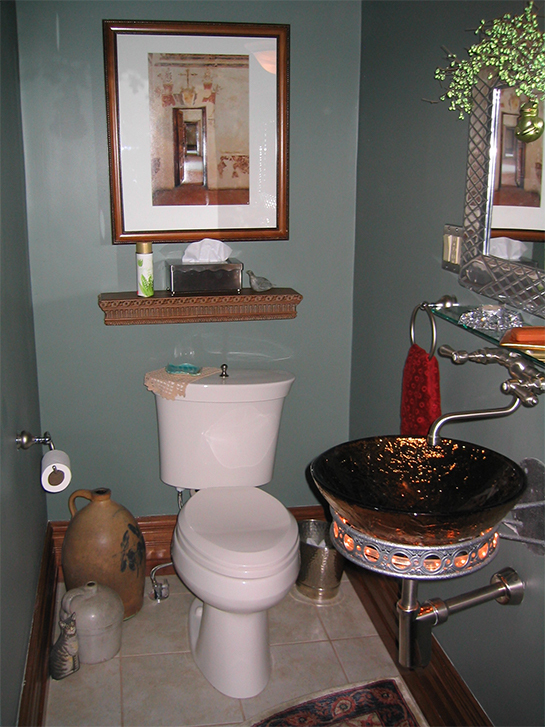 We installed copper colored embossed tin ceiling panels then reinsulated and painted the radiator piping insulation. 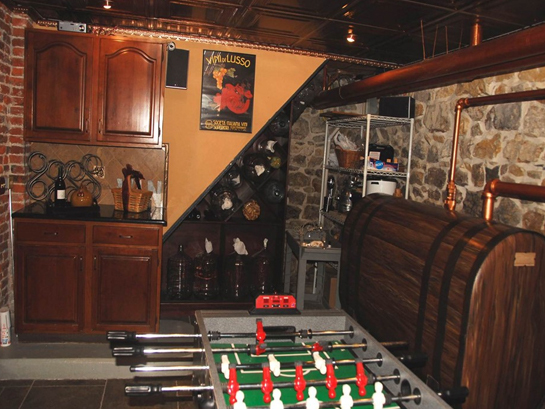 We laid ceramic flooring with embossed tiles then made wine racks, painted the oil tank to look like a wine cask, and added adjustable lighting, surround sound and a surveillance camera system. 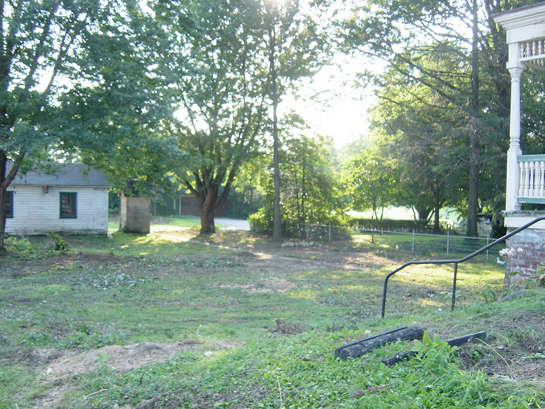 Outside we started by clearing the lot of debris, the chicken house and removing the broken concrete walkways. 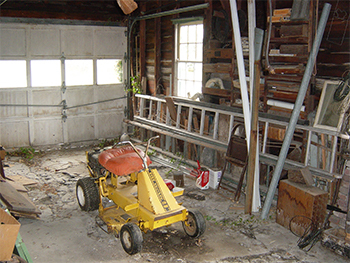 We emptied the garage then pressure washed and sanded the out-buildings. Then we painted it. After that the garage still didn’t meet our needs. We prepared plans, got the zoning approved and began the work to build a new six-bay “doghouse” as my wife likes to call it. We removed two huge silver maple trees and built a six bay 40’x32’ heated and air conditioned garage and workshop with 10’6” ceilings. We wired the shop for data, phone, cable TV and surround sound. 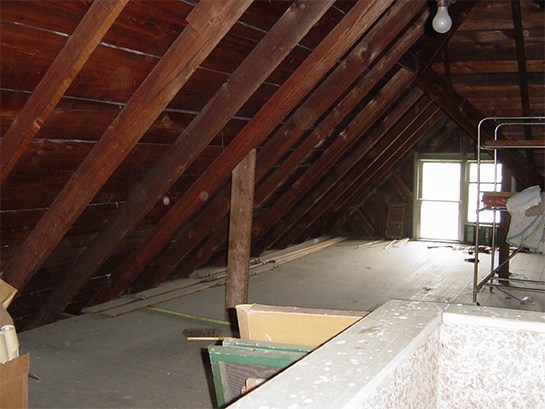 We epoxied the floors and added motion activated lighting and an elevator system to store items in the attic. 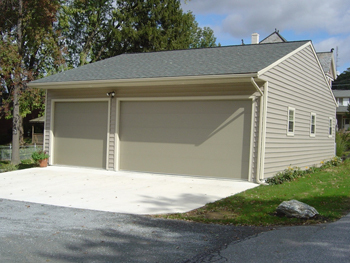 We installed insulated steel garage doors, a wireless motion camera system, deadbolts and motion activated security lighting. 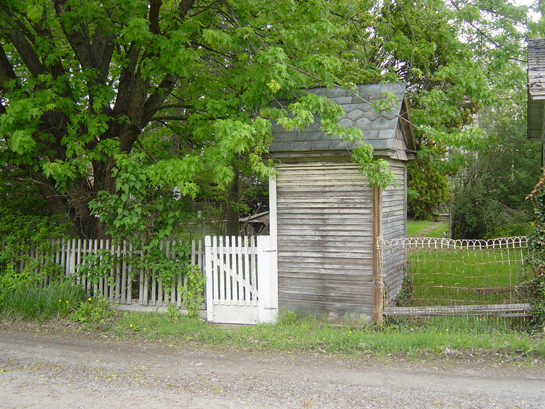 The 105 year old two seat outhouse roof has an architectural slate roof that matches the house. We moved it to a new concrete foundation, upgraded it with treated 4×4’s and composite flooring and ran plumbing for a future shower and added lighting and a vent fan. We kept one original pin oak tree and added new trees, shrubs, plants, grass, two gardens and paved the driveway while adding parking. We installed a drip irrigation system and property wide low voltage accent lighting. 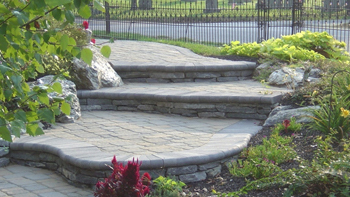 To keep the theme of the old home we installed a brick paver patio and walkways with limestone retaining walls. 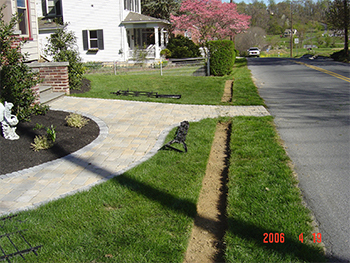 We installed twenty five hundred square feet of brick paver walkways from the Trolley Lane alley to front of our home. Our patio with the limestone walls and paver circle kit complement my wife’s herb garden (shown below beside the back porch steps) and the original foundation of the house. Where there used to be a half dozen concrete steps we created new step areas with a wider safer surface that lead to the front of the home. As part of the new walkway we added circular steps at the garage and kitchen. This change required both sets of stairs and risers to be remade. We upgraded the stairs with new pressure treated stringers topped with 12” wide x 1-1/8” thick mahogany treads and 5/4 PVC risers. 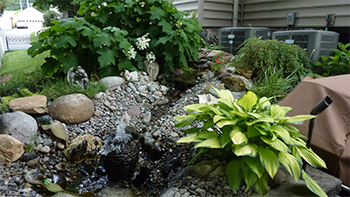 We added a pond-less waterfall with plantings and lights; and plumbed our two gas grills to use the propane tank beside the garage. 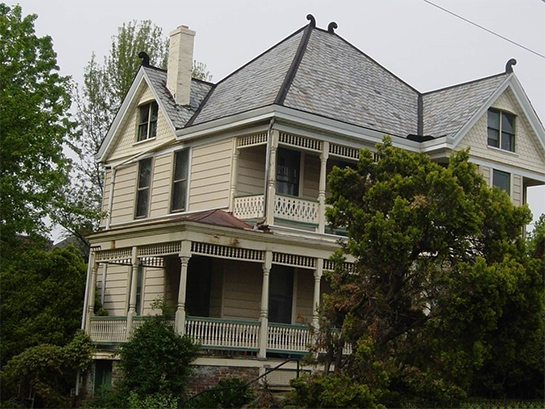 Over the course of the past 100 years the original tin roof and gutters pitted and the subsequent leaks had rotted out the insides of the two corner posts as well as the supporting floorboards and joists on the kitchen porch. Further examination proved that the mortar holding the stone piers together had failed. To begin the repairs we removed all of the old material and put in sono-tube piers, dug out foundations and rebuilt the cistern walls. During the renovation, we learned that the downspout clay pipes to the cistern had cracked and undermined the brick walls holding up the back porch. So down that came as well. 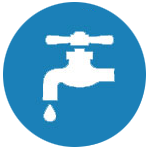 Due to the amount of water possible running through the copper downspouts into the cistern from a several day rain (we found out the hard way) we added both battery and line voltage sump pumps and an underground discharge pipe system to expel rainwater. 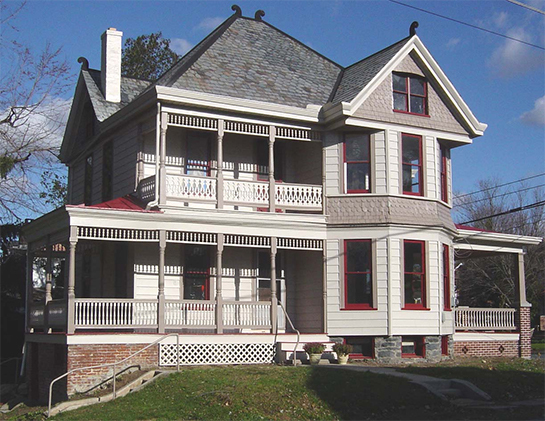 We rebuilt the back first floor and 2nd floor porches. We replaced the joists with treated 12”x 2” material, made new 1-1/8” thick tongue and groove flooring and replaced the fascia then wrapped the fascia with color matched aluminum. We rebuilt the rear porch roof trusses and rebuilt all of the box gutters with ice and water dam and rubber roofing material. We turned new 5 ¾” square x 99” tall cedar posts to replace the damaged posts, mortised the handrails back into place. We installed a new standing seamed copper roof and replaced all the downspouts with copper downspouts. We insulated the house with blown in dense pack cellulose, wrapped the home in house wrap and accordion foam insulation then covered it with beaded vinyl siding and wrapped all the trim in 3 color aluminum. We removed the old cedar shakes and wooden underlayment with the newspaper insulation replacing it with new fiberglass insulation covered with CDX plywood, ice and water membrane and new cedar shakes cut to match the originals primed, caulked and repainted all. 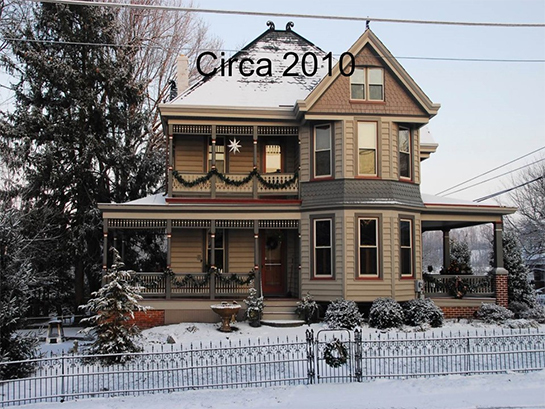 To complete the exterior look we painted all of the “gingerbread in the same four colors.